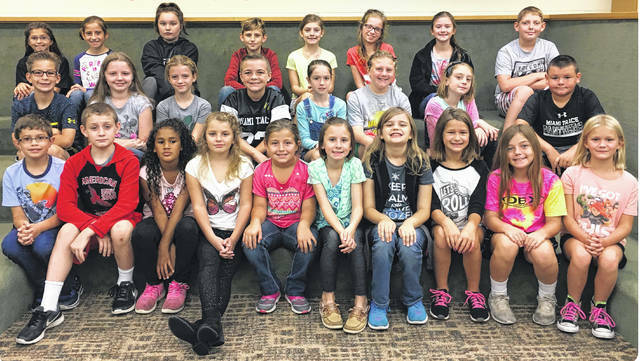 The Miami Trace Elementary School named the September Students of the Month recently and gathered them for a photo. Pictured (L to R) are the kindergarten through second grade students selected: front row: Henry Meyer, Kamri Reno, Carson Cooper, Gabriel Chain, Daphne Zink, Bentley Ervin, Zachary Caldwell, Gracie Swaney, Jace Noble and Blakeley Chain. Middle row: Kayla Cagg, Maya Rickman, Henry Dhume, Janessa Cruz, Celia Morrison, Christian Lippert, Lane Coe, Colleen Gary, Hartley Allen and Mason Haslett. Back row: Ella Butts, Izzy Hall, Sydney Forsha, Kiera Leach, Braiden Berry, Landon Horton, Makinzyn May, Austin Woods, Carter Davidson and Xavier Lowe. https://www.recordherald.com/wp-content/uploads/sites/27/2017/10/web1_k-2.jpgThe Miami Trace Elementary School named the September Students of the Month recently and gathered them for a photo. Pictured (L to R) are the kindergarten through second grade students selected: front row: Henry Meyer, Kamri Reno, Carson Cooper, Gabriel Chain, Daphne Zink, Bentley Ervin, Zachary Caldwell, Gracie Swaney, Jace Noble and Blakeley Chain. Middle row: Kayla Cagg, Maya Rickman, Henry Dhume, Janessa Cruz, Celia Morrison, Christian Lippert, Lane Coe, Colleen Gary, Hartley Allen and Mason Haslett. Back row: Ella Butts, Izzy Hall, Sydney Forsha, Kiera Leach, Braiden Berry, Landon Horton, Makinzyn May, Austin Woods, Carter Davidson and Xavier Lowe.